Among the Usual Days: Early Shoes: Left or Right? Early Shoes: Left or Right? But don’t assume these shoes were anything like the ones we wear today. In fact if you have ever struggled to teach a child which shoe goes on whcih foot look back to the "good old days". 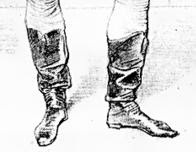 Up until the 1840s there was no such thing as a right and left shoe. Once shoes were worn for a while they would shape into a right or left foot but new shoes were not well fitted took some uncomfortable breaking in. Toe shape varied from pointed to squared as fashions changed. Shoes could be fancied up like the women’s shoes shown here or they could be quite simple, resembling a simple ballet slipper. Sometimes buckles were in vogue and other times not. But new boots and shoes alike began with this lack of fitting.